A group of young Cambodian girls recently took part in a mobile app competition for girl coders in California. Traveling from their home country to participate in the global competition, their story offers inspiration for other girls around the world to consider a career in tech. VOA's Sophat Soeung reports from Silicon Valley. A group of Cambodian girls who recently traveled to California to compete in a mobile app competition offered inspiration for other girls worldwide to consider careers in technology. Their pitch in Silicon Valley wasn't a bid to be the next billion-dollar company. Instead, they want to help their country with a mobile phone application to address poverty. "Let's fight poverty by using our app. Don't find customers for your product, find products for your customers," said Lorn Dara Soucheng, 12, who led the team that created the app, Cambodian Identity Product. 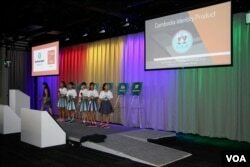 "We want to increase employment for Cambodians, so there will be a reduction of Cambodian migrants to work at other countries, reducing poverty through making income and providing charity to local Cambodians," Chea Sopheata, 11, told the judges at Google's headquarters. Google was one of the program's sponsors. To participate in the Aug. 7-11 Technovation global competition, girls around the world had to build a mobile app — and a business plan — that addressed a U.N. development goal. The Cambodian girls picked poverty. While globalization has boosted Cambodia's economic growth, especially its tourism industry, it has also created greater economic inequality and competition. The girls think their app can help. "We want to promote our culture to people from all over the world," said Lorn Dara Soucheng. At their young age, no one expects these girls to be able to solve their country's most pressing issues quite yet. But their presence here highlighted another issue: girls in tech fields. In the U.S. and worldwide, the number of women in STEM fields (science, technology, engineering and math) remains low or even has dropped. In Cambodia, just 14 percent of students in information technology were women as of 2010. It's a situation some attribute to a lack of equal access to education and a lack of female role models. It's hoped that programs like Technovation can reverse that trend. "For the first time in history, technology can really help girls have a strong voice and help us have a society that has equality," said Tara Chklovski, founder and CEO of Iridescent, the nonprofit organization behind Technovation. These young Cambodian girls have proved how far they can go with technology. Most come from underprivileged backgrounds but had support from teachers, mentors and family. Cambodian American Pauline Seng, a program manager at Google, said the young coders have become role models for many other Cambodians, including herself. She didn't get into technology until she was 23. "There's going to be so many people who aspire to reach this stage and also inspire other people to get involved in technology," she said. 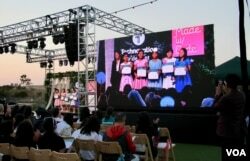 Although the Cambodian girls did not win the grand prize, which went to a team from Hong Kong, they were proud to have made it to Google and Silicon Valley. After watching the male CEO of Google, Sundar Pichai, speak at the closing ceremony, the girls said they believed the tech giant would one day have a female leader. "Yes!" they said, in unison. Whether that will come true or not, they have themselves already become the youngest role models to inspire others, one girl at a time. Deana Mitchell contributed to this report, which originated on VOA Khmer.